We have some fantastic offers on from October to December 2018. After you've watched our handy video below, click the link at the bottom of the page for more information. With autumn upon us, the nights getting darker and the temperatures dropping, we’re soon going to be moving towards celebrations that involve fireworks. In the UK many towns and cities plan celebrations for Guy Fawkes and Bonfire Night and Diwali, right through to New Year celebrations at the end of the calendar year. As a pet owner, it’s important to be aware of the celebrations in your area and also how to make your pets as safe and comfortable as possible. Don’t forget to ask your neighbours if they’re planning any fireworks displays of their own! Fireworks can cause a lot of stress, particularly in dogs and sometimes in cats. You may notice your pets hiding, being very vocal, trembling or even showing destructive behaviour if they become scared. Don’t suffer in silence, we’re here to help. Read our top tips below, or you can book a free appointment to come see us at any of our 13 branches where we personalise our advice to your pets specific needs. Here are some top tips about fireworks and pets in preparation for this year’s firework season. This sounds simple but our pets are very receptive to our own behaviour and mood. Remaining calm, happy and cheerful will send positive signals to your pet. If you have a dog, try to continue with the same routine if possible and keep your dog well exercised during the daylight hours before there is a risk of fireworks. Let your pet retreat to a place in the house that they will feel safe and don’t remove them from this place or make it unavailable for them. You could also make a safe den – try providing an unwashed jumper and one of your pet’s toys to provide them with the comfort of your scent and their usual surroundings. Ensure you are able to remove any visual fear stimulation by closing the curtains or blinds before dusk when fireworks are likely to be going off. Keeping the lights on in the house will reduce the flashes from fireworks that still sneak through the curtains. Even if it means changing your feeding schedule slightly, it is advisable to feed your pets before the fireworks are likely to start. A fearful pet may quickly lose their appetite. It is advised that you keep dogs and cats indoors during fireworks. Even if you have a pet cat that is not particularly fearful in the house, they may become frightened if they are exploring outdoors. It’s worth ensuring both dogs and cats are microchipped and wearing an ID collar, just in case the unthinkable happens and they run away or manage to get out of the house. Especially if you know your pet to have noise phobias, you may want to invest in a diffuser and plug this in at least a week prior to planned firework celebrations. You can use specified diffusers for both dogs and cats, which release pheromones to help your pet cope with challenging situations. Although we can’t smell the diffuser, it can be very effective for our pets. 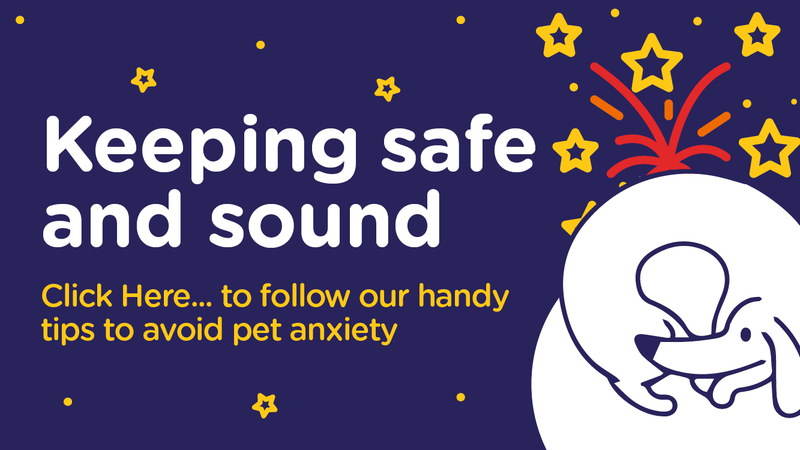 If you need further advice, or you have already seen your pets displaying fearful behaviour around fireworks and loud noises, your veterinary nurse or vet will be able to give you the best advice that is tailored to your pet and your situation. In more serious cases our vets may prescribe medications such as tablets and gels to help your pet feel safe and secure during this stressful time. In the long-term it would be worth getting advice on behaviour modification. If you have any questions or queries relating to your pets and fireworks please contact us on 01924 465592. For more in-depth advice about firework fears and noise phobias in dogs and cats, read our useful pet advice article. Check out our 2018 special offers! Next PostNext We’re bowled over by the breathtaking feats of Jess the Jack Russell!